Juan Garcia Esquivel was a self-taught musical child prodigy. He figured out how to disable the mechanism on the player piano in his house so that he could play it himself. By age seventeen he was already the bandleader of an orchestra for a comedy show at a radio station and quickly became an innovator in stereophonic sound. 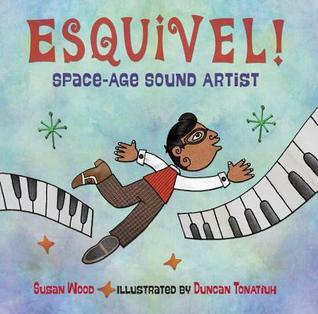 Esquivel created a style and sound all his own that became iconic of soundtracks of the 1960s. If you want to hear his influence in a more modern soundtrack, check out the Austin Powers theme song to give you an idea of what kind of music Esquivel was creating. But if you're going to read this book at all, you can't truly appreciate Esquivel's genius without listening to his actual music. So here is an Esquivel playlist on YouTube for your listening pleasure. Play it whilst reading this book. Juan started experimenting with popular Mexican tunes. He tinkered with tempos, slowing songs down, then revving them up. He fiddled with dynamics, swapping soothing soft sounds and startling loud sounds. He twisted chords and combined instruments to sound thrilling, dreamy, and often funny, because Juan liked music that made people laugh. But underneath the humor, it took great music skill to play Juan's challenging music. What a perfect example to share with kids about writing with precision. The verbs Wood uses in that paragraph are all strong and action-oriented: tinkered, revving, fiddled, swapping, twisted, combined... along with precise musical nouns: tunes, tempos, dynamics, chords, instruments. The illustrations of Duncan Tonatiuh are typical of his style, which is inspired from ancient Mexican art. I have read a few other books that Tonatiuh has illustrated and I have to admit, the style takes some getting used to. It's very flat and all of the people are always illustrated from a side profile. While this aspect of his illustrations takes some getting used to, what is always a delight about them is his bold lines and bright, opaque colors. A great book for music lovers of all ages.